Focus now turns to the second National Title of the season, the MIXXFM, Speedway Sedans Australia, National Production Sedan Title, to be held at the Western Speedway, Hamilton, commencing of Friday with official practice, followed by racing on Saturday and Sunday. Forty four drivers will take part, with National Champion, Trevor Mills looking to become the first driver in history to win the event three consecutive times. Eighteen entries have been received from Victoria, fourteen from New South Wales, seven from Western Australia, four from Queensland with Jayden Edwards being the sole representative from South Australia. The field includes three National Champions, with Stephen Laidlaw and Rod Musarra also entered, along with a host of State Champions spread across the field. In recent weeks, several drivers have put their hand up to challenge for the title, including Beau Riley from Western Australia, who recently won the Victorian Title, and Joel Berkley, who won his seventh Feature race of the season on Saturday night in Queensland. Mills though, will not hand over his title easily, with the two times winner of the event, coming back from the brink last season, to record a magnificent victory at the Fraser Shores Speedway in Maryborough, in the National Title. 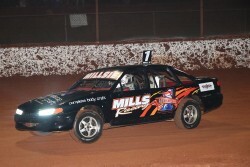 Mills a seasoned campaigner, has also won the Victorian Title on three occasions and podiumed on two other occasions across the last decade, along with four New South Wales State Title wins, making him one of the highest credentialed drivers in the field. Another is Stephen Laidlaw from Victoria, with the veteran driver having won the National Title in 2002 and 2003. Despite the length of time since his last win, Laidlaw continues to be prominent in results, with the three time Victorian, two times NSW and South Australian Champion, and 2016 WA Champion, right in the thick of the action in the Victorian Title a fortnight ago, when mechanical failure let him down, putting him into the wall in turn four. Rod Musarra, the 2010 National Champion is also entered, and is also expected to be prominent. The West Australian, has never won his home State Title, having finished second on five occasions, a State record. Fellow West Australian, Kane McDiarmid is also a part of the strong West Australian contingent, with McDiarmid having finished on the podium in two of the last three National Titles, with the winner four Feature races this season also expected to figure prominently. With drivers from Queensland, New South Wales, the ACT, South Australia, Western Australia and Victoria all entered, the National Title is poised to be a very hotly contest event, with many drivers with legitimate claims to the National crown. Hamilton can be extremely hot at this time of the year, but this weekend it will be 30 degrees for practice, 31 for the opening night of heats and just 24 degrees for the final round of heats and the finals, with the temperature on track to make up for the physical weather.